Soccer Practice Day 1 - Villa Soleada F.C. Soccer Practice Day 1 – Villa Soleada F.C. Today was our first day at soccer practice for the U-10 boys from Villa Soleada. We have about 15 boys from the village and 6 boys from the children’s home playing together. Wilson and Tono are going to be coaching them four times per week. The two are brothers and are respected fathers in the community. They both also work for our organization as professional masons. Tono has actually been moved up to become one of our site managers. The first day at soccer practice was more like the first day at MMA practice… Every time I broke up a fight, there was another fight breaking out behind me. But I think the kids had a good time. Let’s hope that Wilson and Tono don’t get too discouraged because the kids can get so out of control when they are excited. 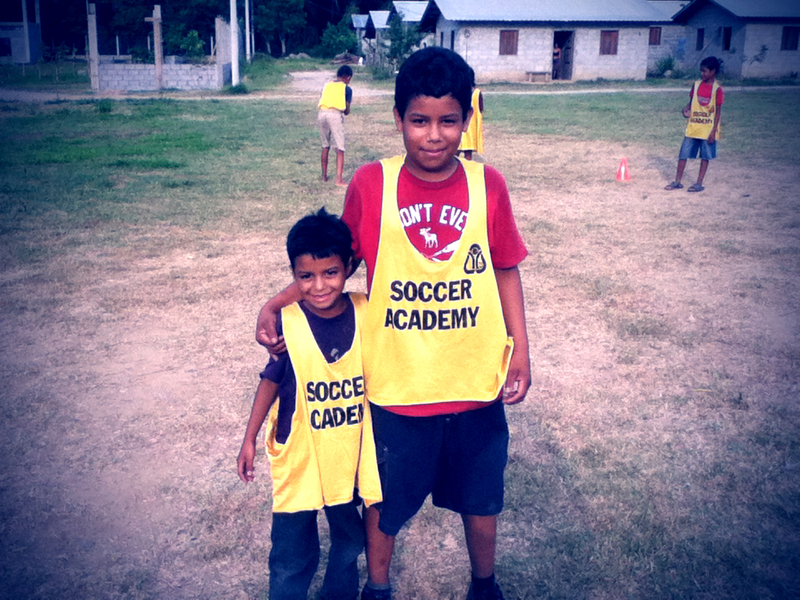 Josecito and Antonio at soccer practice, wearing the donated pinnies from Milimo Thindwa and Soccer Academy.